Jack Barrell at his papershop in the High Street where it still is. Jack Barrell ran the newsagents in the High Street, opposite St Mary’s Church. His grand-daughter, Helen Barrell, believes he retired in the 1960s. He lived a long life, passing away in 2005, aged 95. John Stewart used to be one of his newspaper boys with a round very day. It seems Jack was very keen to ensure every person got the correct newspaper and would check the records of every boy when they got back to ensure they had delivered the newspapers as instructed. He was well known for having a very quick, dry wit, at least, he had this reputation in the Barrell family but it is not known if this view was shared by his customers. 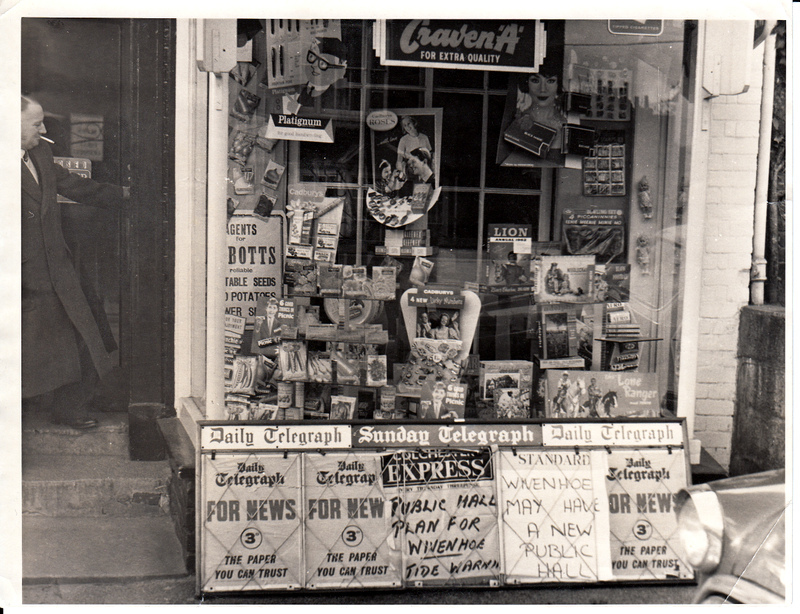 The adjacent photograph records Jack standing in the doorway of the newspaper shop. Judging by the headlines on the bill-boards outside the shop, the date of the photograph would have been taken in the early 1960s as the Public Hall (later renamed the William Loveless Hall to commemorate WUDC Cllr WG Loveless) was not opened until 1965. It seems there was a long-running feud between Jack Barrell and the chap in charge of the bell-ringers at St. Mary’s. Jack said the bells gave him a headache. So nothing much has changed in Wivenhoe as the bell-ringers still practice on a Wednesday evening. 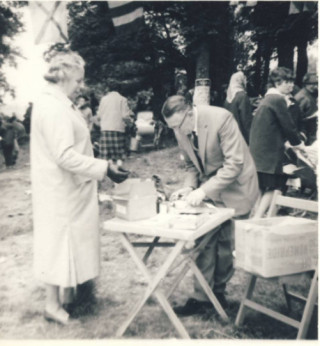 This second photo was taken at a Scout and Guide fete in the 1960s probably on the KGV field close to where the Scout & Guide Hall is now. Given that the Hall wasn’t built until 1965, although the land had been sold by Arthur Worthington for a modest sum earlier, and the Committee were busy raising the £1,400 to build the Hall, the fete may have been early in the 1960s. At the table is Jack Barrell who was Treasurer of the Scouts at the time and the lady is Winnie Turner (nee Cook). Did Win work in Jack’s shop? This page was added on 14/05/2015.